High streets across the UK have had their worst April for more than two years as heavy rain shrinks consumer footfall. 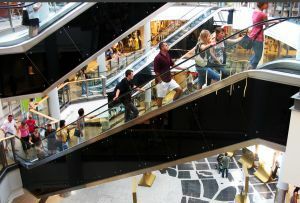 According to the British Retail Consortium (BRC)/Springboard-ACTM Footfall Monitor (quite a mouthful, that), rain has prompted the biggest shopping downturn since 2009. High street custom is down 6.4% in the first quarter from February 2012, and footfall at out-of-town shopping centres has dropped 2% year on year. This is dire news for UK retailers, where more than one in 10 premises are lying empty. Worst hit is Scotland, where shopper numbers are down 12.6% for the quarter. Wales was the only region to see a lift in footfall at 0.6%. But then they are used to rain in the valleys (there are 40 different Welsh words for the stuff, after all). Let’s just hope that the sun shines on the upcoming long Diamond Jubilee weekend, eh?